Water damage can cause serious problems for property owners in Apple Valley. Fortunately, professional water damage restoration services are only a phone call away with 911 Restoration of The High Desert. 911 Restoration of The High Desert can help home and business owners who experience water damage caused by floods, burst pipes, heavy rains, winter storms, and more. Property owners in Apple Valley can contact us any time of the day or night. Water damage restoration techs can reach properties around Apple Valley within 45 minutes of an emergency call. Our techs can offer you a free visual inspection for property owners only upon reaching your property. Let us provide you with immediate information about the best ways to handle your water damage restoration needs. As a locally owned and operated company, 911 Restoration of The High Desert puts your peace of mind first. Let us begin the water damage restoration process right away so you can get your life back to normal after a flood or plumbing emergency. You can count on us to fully restore your property to perfect condition. Let us make sure that you can move forward towards a Fresh Start after any type of water damage. 911 Restoration of The High Desert can even send samples of your mold to a 3rd party laboratory to ensure we know exactly what kind of mold you’re dealing with. Techs will use cutting-edge equipment to locate mold hidden behind walls or under floors, so you can be sure that the mold removal process is carried out completely. Let us get to work on the mold remediation process right away. Mold will continue to spread if it is left untreated, causing further damage to your home or business. Mold experts also warn that some forms of mold can pose serious risks to your health and well-being. 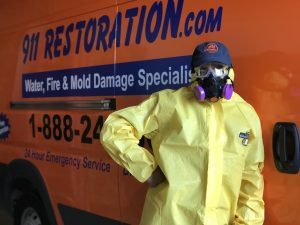 Apple Valley property owners can get the mold remediation services they need by contacting the experts at 911 Restoration of The High Desert. We can take on any mold challenge, including black mold removal. Techs will take care of thorough mold decontamination and odor removal. By the time we are done, you will not even be able to tell that a mold infestation ever occurred in your home or business. Commercial and residential property owners in Apple Valley can face water damage for many different reasons. You deserve help from a professional company if you are trying to recover from a pipe burst or floods caused by heavy rains. 911 Restoration of The High Desert knows what it takes to successfully handle flood cleanup. Let us focus on removing damaged materials from your home or business. Techs can dry and dehumidify your property, using infrared scanners to detect even small traces of moisture. Ensuring your property is dry can reduce the odds that you will experience a mold infestation. However, if you do notice mold growth, you can call our mold removal experts to get immediate help, starting with a professional mold inspection. The techs at 911 Restoration of The High Desert have the experience and equipment necessary to handle water damage emergencies of all kinds. Let us bring professional grade pumps and air movers if you need help handling flood cleanup, sewage backups, business flooding, or home flooding. All the water damage restoration technicians at 911 Restoration of The High Desert are licensed, bonded, and insured to handle property restoration. Techs are trained to work with all insurance companies to make sure that the property restoration process goes smoothly for you. You can get the help you need to get a Fresh Start after experiencing water damage in Apple Valley by calling 911 Restoration of The High Desert now. Servicing the cities of Adelanto, Helendale, Hesperia, Lucerne Valley, Oro Grande, Phelan, High Desert, Pinon Hills, Wright Wood, Victorville, and surrounding areas.